In the new snapshot series trees appear to spawn closer together. This is not a bug. 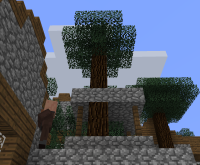 However, most villages in biomes with trees appear to be overgrown with trees. Trees spawn in the middle of paths, houses, wells, etc. Example: Village at 1056, -1292 in a world with seed "18w16a"